Buy Volatility As Your Hedge – Why Not? I must have dreamt it but…..I could have sworn I’d posted this chart some time ago. 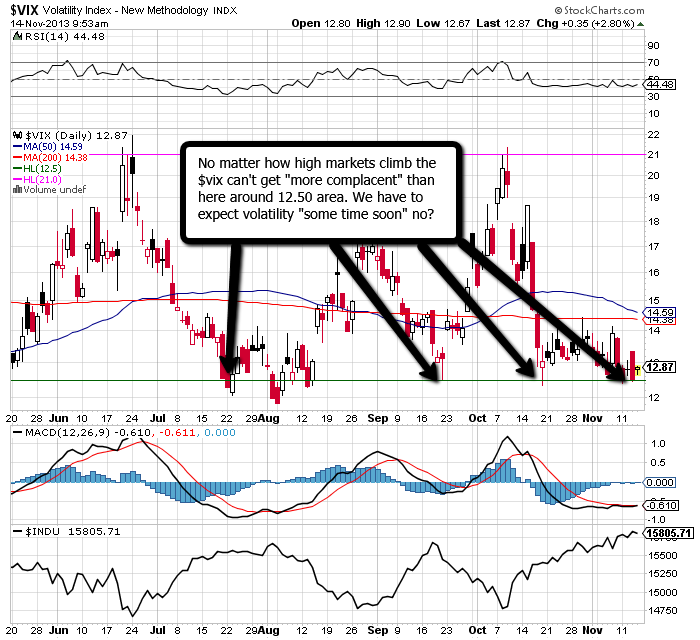 A quick look at $VIX. THE VIX REACHED 90.00 AT THE HEIGHT OF THE CRASH OF 2008 IF THAT MEANS ANYTHING TO YOU. Volatility “rises” when fear sets in. This cannot be questioned. The $Vix has “bobbed along the bottom” for the entire Fed driven rally, and cannot / will not break below around 12.50 no matter how high the market goes. This is complacency to a degree BEYOND my scope of understanding….as it’s painfully clear that most people have indeed been “lulled back into thinking” every is going to be alright. THE VIX HIT 90.00 back in 2008! Previous Article Risk Appetite – You'll Get It "Eventually"
Next Article The Smart Money Trade – Is That You? Playing connect the dots, I’m guessing this is exactly why Kong’s in GBP/AUD; look what happened to that pair in ’08 when the VIX was 90. This pair is usually a good play if you want to be long VIX. Hi Kong, I still highly doubt that we will see USD weakness any time soon. Ichimoku is getting even more bullish after the Fed’s minutes. I’m doing well. Thanks. Wish you better and better, more profits and also everything going smooth! Thanks for sharing the latest what you have in mind and the latest info. Gbp/usd unlikely will drop to 1.57. Still bullish on pounds for longer term. Yes the GBP trade has been fantastic here these last few days! GBP/USD could have another 100 pips left in it before it’s up to resistance, and as for the other pairs such as GBP/AUD and GBP/CAD, GBP/NZD – somebody pinch me! This late in the game….with a staggered approach? I’d find it “highly unlikely” you’d be holding for “that long” short of seeing things move into profit no?